It’s kinda funny how you can see something so many times, and you still don’t really SEE it. I think we do that in all parts of life. We do it to our partners, friends, parents, kids, our surroundings… we often fail to appreciate how amazing they really are. ‘Can’t tell you how many times I have seen the Star Wars movies, yet I had no idea there was a bag on the bandolier across Chewie’s chest. My hubby, who has seen the movies at least five times as many times as me, had not noticed either. Oops. Must be all the fur in the way. Every Halloween, in the name of “research,” we “have” to watch the movies. So of course, when we were making the Chewie costume, we did as well. 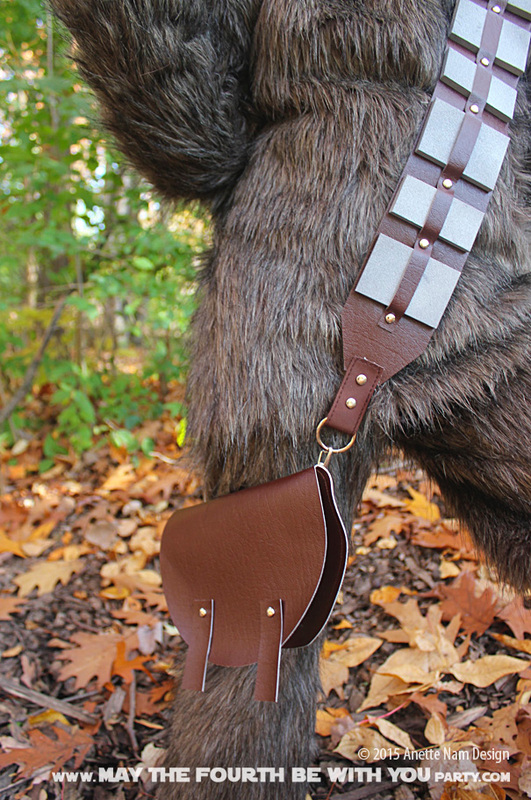 And this time we noticed with surprise that Chewbacca had a bag on his ammunition belt. ‘Not sure what he keeps in there, but we kept vampire teeth in ours. #1 just hated the fake teeth, so we had to ditch those pretty early on. Spray paint strips in grey primer. Let dry. Turn to other side and repeat. Let dry. Spray with silver. Let dry. Turn to other side and repeat. Let dry. Cut a pleather band 2.75″ wide and long enough to hang across the torso and then some (ours was 46″). Better off making it too long and adjust at a later stage. Cut another band 0.625″ wide and a few inches longer than the bag strap. Starting about 2.5″ inches in from one end, glue the silver bars down on the band, alternating large and small. Keep a space of about 0.875 between them. (We made a foam spacer bar of 0.875″ to get the spacing even). Keep going until you have the almost the size strap you need. Leave 2.5″ at the end. 1.125″ from the end of the belt, make a hole with the awl in both the strap and the band. Insert a grommet. Close. Do this between all the silver pieces, and at the end. Cut the corners of both ends to create points on the ends of the strap. Find a plate that has the same diameter as you want your bag to be. Fold pleather in half. Use the plate and cut a semicircle through both layers. This will be the back and front flap of the bag. Cut another semicircle for the front of the bag. Sew swivel hooks on the back by hand. Cut 2 small pleather rectangles. Put a small hole in each rectangle and in the bag front flap where you want the brads. Make sure you get a fake leather with brown or black backing. It’ll look nicer. When I bought this, there was no time to order online, and Jo-Ann only had the white back available. I was able to find D Rings already attached to the brown fabric, which matched perfectly with the pleather. If you can’t find them, you can easily make your own with pleather and brads and a couple of D rings. We added a safety pin to the clip of the bag and one on the strap to prevent it from sliding around too much. Many communities recommend that kids and adults do not carry any weapons when Trick or Treating, and I think that is really good idea. So leave the crossbow at home when you go out in public! © Lucas Film LTD, via wookieepedia.com. I had to go to the movies to get good reference of the bag. This is amazing. Did you actually do the crossbow as well? Thank you so much! No we did not make the bow. For the photos we usually buy cheap plastic toys (nerf guns, water pistols, or in this case a suction cup bow) and paint them – MAKING SURE THAT THE TIP IS ALWAYS, ALWAYS, ALWAYS bright orange to indicate a toy weapon. When the kids (or adults for that matter) are wearing the costumes in public, for obvious safety reasons, we never bring the weapons.